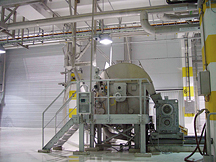 CONUSTRENNER Pilot Plant Hire With the CONUSTRENNER Pilot Plant, the operating behavior of a large facility for fiber recovery or fine filtration can be tested realistically on site. The CONUSTRENNER has a multi-layer stainless steel screen for targeted separation of fibers. It is outstandingly suited for fiber recovery, e.g., from the white water of paper machines or from fibrous filtrates of thickeners or washers. The mesh size of the screens can be adapted to the respective application. The CONUSTRENNER is therefore also suitable for fine filtration (e.g., preparation of clear filtrate to PM shower water). It offers an extremely compact design, high reliability and, given its high capacity, comparatively low investment and operating costs. With the GYROSAND Pilot Plant, the operating behavior of a large facility for sand filtration can be tested realistically on site. The GYROSAND filter is a sand filter for water preparation and waste water treatment that allows continuous operation at the highest level of efficiency. Its stand-out feature is a flushing device that ensures con­tinuous regeneration of the sand without any downtime for flushing cycles. The GYROSAND is especially suitable for fresh water preparation, advanced cleaning of filtrates and waste water, preparation of shower water or removal of color. ELEPHANT Pilot Plant Hire With the ELEPHANT Pilot Plant, the operating behavior of a large facility for thickening or pre-dewatering can be tested realistically on site. The ELEPHANT is a high-performance disk thickener/filter that can be used for numerous applications. Dewatering takes place solely through gravity. Typical areas of use are thickening of fine rejects, stock, sludge, broke, as well as ash removal or fines removal and water treatment. The ELEPHANT filter stands out because of its modular concept and the special design of its screens. It is extremely compact, easy to operate and maintain and rugged in design ensuring high reliability in daily operation. 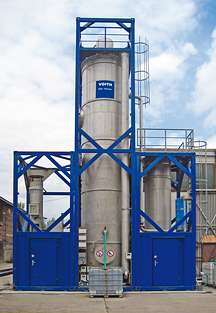 DELTAPURGE® NG Pilot Plant Hire With the DELTAPURGE® NG Pilot Plant, the operating behavior of a large facility for dissolved air flotation can be realistically tested on site, and also combined with systems for fiber recovery, thickening and advanced preparation, if applicable. The dissolved air flotation process achieves targeted removal of solids (fibers, fines, ash) and colloidally dissolved substances (micro-stickies or anionic trash) from filtrates, internal water loops or effluent in paper production. Dissolved air flotation is the efficient and proven solids removal and cleaning process that is used in a multitude of applications with internal water loops and with effluent treatment. Lime Trap® Pilot Plant Hire The Lime Trap® Pilot Plant tests the operating behavior of an industrial-scale Lime Trap® on-site under realistic conditions, such as in combination with the R2S Anaerobic Demonstration Plant Hire. 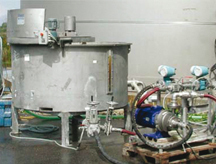 Using the Lime Trap® process the dissolved calcium content is removed systematically at a suitable location within the process, in combination with the specific adjustment of water properties, so that problematic deposits no longer occur. The process constitutes a regeneration process for internal water loop clarification and produces water with a low lime content. R2S Anaerobic Demonstration Plant Hire The R2S Anaerobic Demonstration Plant allows the operating behavior of an industrial-scale R2S anaerobic reactor to be tested on site under realistic conditions. The R2S reactor is a two-stage high-performance reactor for anaerobic effluent treatment of industrial effluents with high calcium contents, particularly from paper manufacture. Its special design allows an effective degradation of the dissolved organic load in an extremely compact environment with minimum footprint requirements. Most of the organic compounds contained in the water are converted to biogas. The resulting biogas can be transferred for utilization as an energy source ("green energy"). E2E Anaerobic Demonstration Plant Hire The E2E Anaerobic Demonstration Plant allows the operating behavior of an industrial-scale E2E Anaerobic Reactor to be tested on site under realistic conditions. 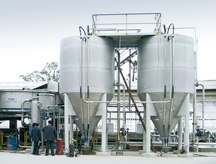 The E2E Anaerobic Reactor is a high-performance reactor for the anaerobic treatment of industrial effluents (paper, drinks, foodstuffs), operating on the fluidized sludge bed principle. Organic compounds (COD, BOD5) are converted to biogas and a small amount of excess sludge. 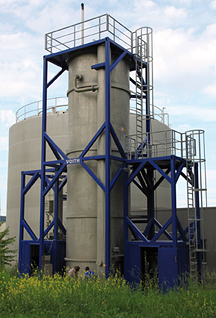 The biogas is available for further treatment and utilized as an energy source. 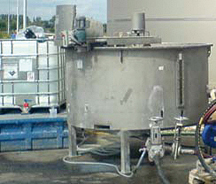 Anaerobic Pilot PlantThe Pilot Plant is used for on-site investigation of the anaerobic bio­logical treatment of various types of process water and effluents. 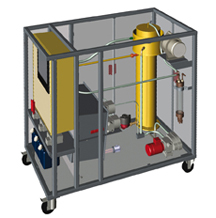 It is designed to be able to simulate the operation and settings of a Voith Anaerobic Reactor, including auxiliary systems. The results of the investigation can be used to draw conclusions as to whether the implementation of an anaerobic stage for internal process water/effluent treatment is the appropriate process in terms of technology and cost effectiveness. The organic matter in the process water is converted to biogas with minimal energy use for production of “green energy”.